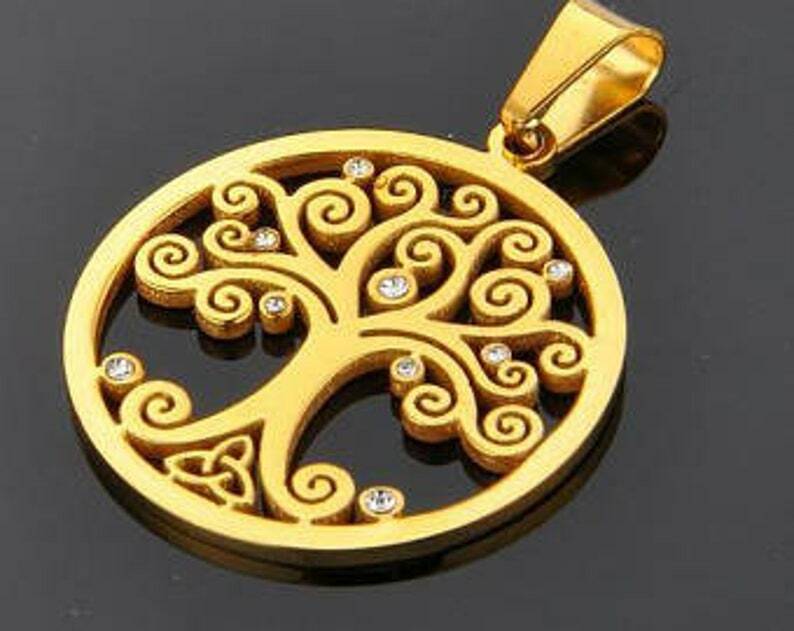 Item #ALI1014 - Brand New Stainless Steel Celtic Tree of Life With 18k Gold Plating Necklace Pendant Plus FREE In-Country Shipping! Buy this pendant along with a stainless steel necklace chain of 20 inches or longer, and we'll discount this pendant by $5.00. This offer is only valid for orders where the necklace chain and pendant ship together to the same location. This nice detailed Celtic Tree Of Life pendant is made of 100% stainless steel, and is extremely strong and durable. It also has tiny little crystals spread throughout it, and is plated in 18k gold. It will not tarnish easily, and is extremely low maintenance over the long-term. It's measured dimensions are in milimeters (mm), where every 24 mm equals 1 U.S. inch. Size = 3cm diameter, or 1.2 inches in diameter. DO YOU WANT TO ADD A LEATHER NECK BAND, TOO? We have over 30 color options of brand new colored genuine leather neckbands you can match with your pendant(s), too, for just $0.25 per inch. They come with a metal lobster claw clasp on one end, and a metal ring on the other. We just need to know the color and length of leather band you want. If interested please email tntptp@gmail for current color options. 1) How many Leather Neck Bands you want. 2) What color you want for each one (please use the color name and item number we have on our site). 3) How long you want your leather neck band, as measured in inches. Once we know that information, we'll set up a personalized Etsy store listing for you, and send you the link. As soon as you've made that purchase, we'll make it all for you as soon as possible, and get it shipped as quickly as we can. Unless the leather neck bands are picked up from us locally, we only sell them alongside pendant or necklace purchases. So, you'll need to view our leather neck band color options thru our base web site. As long as at least one pendant or necklace chain is purchased, we are willing to sell and ship you as many leather neck bands as you want. Item #ALI1015 - Brand New Stainless Steel Celtic Tree of Life With Rose Gold Plating Necklace Pendant Plus FREE In-Country Shipping! Item #ALI1016 - Brand New Stainless Steel Celtic Tree of Life Necklace Pendant Plus FREE In-Country Shipping! Item #TOP1003 - Brand New Stainless Steel Celtic Knot Necklace Pendant Plus FREE In-Country Shipping! Item #WHO-1005 Sterling Silver Heart Pink CZ Necklace Pendant Plus FREE In-Country Shipping! Item #WHO-1001 Sterling Silver Heart Amethyst CZ Necklace Pendant Plus FREE In-Country Shipping! Item #WHO-1004 Sterling Silver Heart Garnet CZ Necklace Pendant Plus FREE In-Country Shipping! Item #WHO-1010 Sterling Silver Faith-Hope-Love Heart Pendant Plus FREE In-Country Shipping! Item #WHO-1002 Sterling Silver Heart Blue Sapphire CZ Necklace Pendant Plus FREE In-Country Shipping! Item #WHO-1002 Sterling Silver Heart Topaz CZ Necklace Pendant Plus FREE In-Country Shipping!